Did you know that wheatgrass has more vitamin C than oranges or more vitamin A than carrots? Wheatgrass is grown from the red wheat berry, a special strain of wheat that produces high concentrations of chlorophyll, antioxidants, active enzymes, vitamins, vital amino acids and other nutrients. It is one of the most nutrient dense substances on Earth, packed with essential fatty acids and chlorophyll. 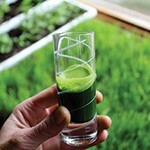 Wheatgrass is a lush green plant that will eventually become a shaft of wheat, produce grain and be harvested. It has a completely different structure when it is still in the grass stage. At only seven days, the blade is 6 to 9 inches tall and can be cut, juiced and consumed or dried into powder, which can be made into tablets or capsules. To get maximum benefit it must be juiced and just 30ml is enough for a daily shot of healthy goodness, the equivalent of eating 1kg of leafy green vegetables. This entry was posted in Healthy Living and tagged healthy living, natural health, organic food, supplements. Bookmark the permalink.